Welcome to the City of Erie Treasurer’s Office official Web site! The City Treasurer’s Office handles the great responsibility of collecting and depositing all revenue that the City receives. The City Treasurer is elected by the citizens of the City of Erie. As an elected official, the City Treasurer is authorized by law and local political subdivision to be the collection agent for City, School, and County Real Estate Taxes. The local political subdivisions for whom the tax is collected compensate the Treasurer and his/her staff for the cost of collections. There are three taxing districts; The City of Erie, Erie County, and the Erie School District. The City of Erie imposes a tax on all real estate in the City. The Erie County Assessment Bureau determines the value of the property on which taxes must be paid. Real Estate Tax bills for the City and County are generally sent out annually by the end of January for the current year together in one envelope. Real Estate Tax Bills for the School District are sent out by then end of July. If you have a mortgage and your property taxes are escrowed, your tax bill should be mailed by you, to your mortgage company for payment from your escrow fund. If property has been sold and you receive a bill in error, please forward bill to the new owner or return to the City Treasurer’s Office with any information you may have. I want to mail my payment and I would also like a receipt. How do I get one? We understand the need to keep track of your expenses. If you wish to have a receipt, be sure to mail your ENTIRE TAX BILL along with a SELF-ADDRESSED STAMPED ENVELOPE and we would be happy to mail them back to you as soon as we have finished processing your payment. Can I pay all my tax bills on one check? Absolutely. Just make sure to double check your addition and your due dates so that you are paying the correct amounts. I mailed my payment on the due date. Will it be late? No. We accept your payment as the day in which it is postmarked by the U.S. Postal Service. My taxes are escrowed. Why are you sending me this bill? We are required to send all tax bills to the homeowner of the property. If your mortgage company requires a copy of the bill for payment, it is your responsibility to forward the tax bills to them. My mailing address is wrong. How do I change it? Contact the Erie County Assessment Office to change your mailing address or to answer any questions about your property’s assessed value. County Real Estate Taxes are based on a calendar year from January 1 thru December 31 of the current year. City tax payments are due and payable on June 30. If you pay your bill on or before the last day of April, you receive a 2% discount. If you pay after June 30, a 10% penalty is added to your taxes until the end of the year. If the taxes remain unpaid as of such January 1, they will be turned over to the Tax Claim Bureau of Erie County. Legislation passed that interest accrues on the Tax Claim Principal Amount to .75% per month or 9% per annum. Such interest rates are effective beginning January 1st. Collection costs related to the Tax Claims are also charged at the time of settlement. City Real Estate Taxes are based on a calendar year from January 1 thru December 31 of the current year. City tax payments are due and payable on May 31. If you pay your bill on or before the last day of March, you receive a 2% discount. If you pay after May 31, a 10% penalty is added to your taxes until the end of the year. If the taxes remain unpaid as of such January 1, they will be turned over to the Tax Claim Bureau of Erie County. School Real Estate Taxes are based on a fiscal year from July 1 of the previous year thru June 30 of the current year. School tax payments are due and payable on November 30. If you pay your bill on or before the last day of September, you receive a 2% discount. If you pay after November 30, a 10% penalty is added to your taxes until the end of the year. If the taxes remain unpaid as of such January 1, they will be turned over to the Tax Claim Bureau of Erie County. Legislation passed that interest accrues on the Tax Claim. 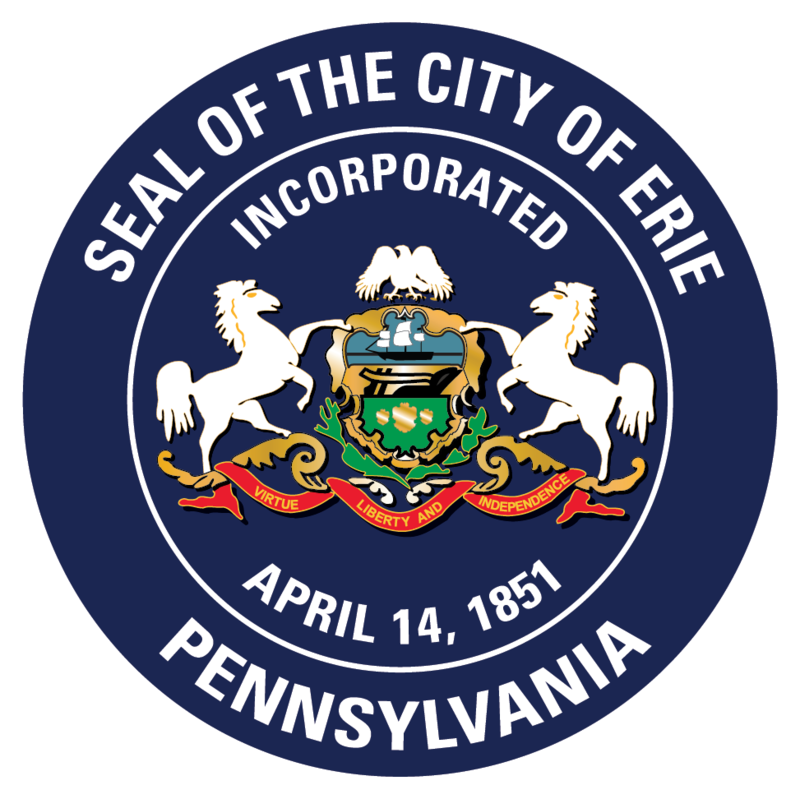 2% Realty Transfer Tax is levied on the sale or transfer of Real Estate within the City of Erie. 1% is shared by the City of Erie and Erie School District and the other 1% goes to the Commonwealth. The tax is paid when the deed is filed with the Recorder of Deeds, located in the Erie County Court House. Generally the transfer of real estate between family member is exempt, such as a transfer between husband and wife, children of the same parent and lineal ascendants /descendants. Property that is received under a will is also exempt and a statement of value needs to be filed with the deed. The County Recorder of Deeds is authorized by law to be the collection agent for both state and local realty transfer taxes. The local political subdivisions for who the tax is collected do not compensate the recorder of deeds, two percent of the amount collected is withheld to reimburse the county for cost of collection. If you are applying for a license that requires the dog owner to be a senior citizen (age 65 or older), or a person with a disability, you must provide proof of age or disability to the City Treasurer or Humane Society. Upon request, a copy of the spay/neuter certificate must be provided. Lifetime licenses can only be purchased at City Hall or by Mail. YOUR DOG MUST BE MICROCHIPPED TO BE ELIGIBLE FOR A LIFETIME LICENSE. Service/Therapy/Emotional Support dog licenses are free with proof of disability or service papers. If fire damage incurred on real property is in excess of $7,500, you and your insurance company need to obtain a Municipal Certificate from the City Treasurer. Certificate along with a copy of City Ordinance #97-1994, Fire Insurance Escrow Fund, about procedures to follow for fire loss, are to be sent to your insurance company. If the City is holding monies in escrow from you insurance carrier, you need to contact the Building Inspection Office to have you property inspected when the structure is brought back up to City Code, either through demolition or repair. Upon completion of this inspection the City will issue a check to you from your escrowed money. Any owner of the property, any named insured or any insuring Agent who violates the City Ordinance shall be subject to penalty of up to $1,000 per violation. Questions Concerning Your Fire Escrow?